The following were honored today at TEEN CHOICE 2014, which aired live on FOX from the Shrine Auditorium in Los Angeles, CA. This year, teens logged on to teenchoiceawards.com and cast more than 164 million votes in support of their favorite celebrities from film, television, music, sports, digital and fashion. Hosted by Modern Family's Sarah Hyland and Teen Wolf's Tyler Posey, the special also honored Selena Gomez with the Ultimate Choice Award. Bella Thorne and Cameron Dallas presented the Choice Candie's Style Icon award to actress, singer and dancer Zendaya for her red carpet style and bold fashion choices. Actress Odeya Rush scored the Olay Fresh Effects Breakout Star Award," which was presented by MKTO and Cody Simpson. The award is a special accolade celebrating a fresh face who is poised to "break out" from the pack and showcase her best, beautiful work. TEEN CHOICE 2014 is executive-produced by Bob Bain (Nickelodeon Kids' Choice Awards) and Michael Burg. Paul Flattery and Kelly Brock serve as producers and Greg Sills serves as supervising producer. 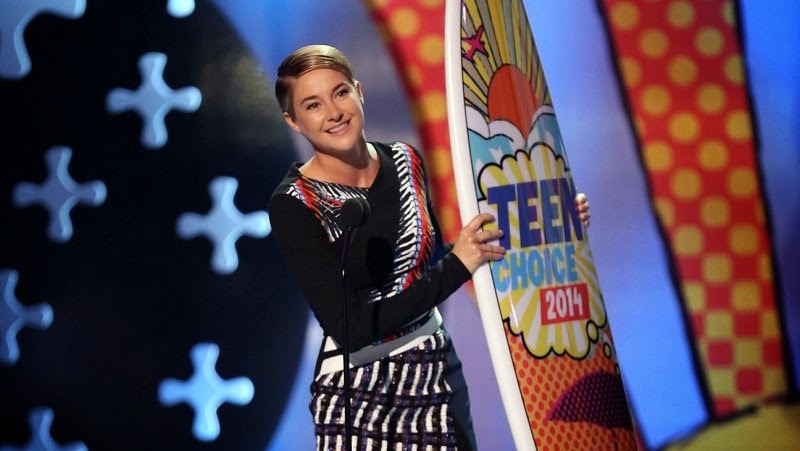 “Like" TEEN CHOICE 2014 on Facebook at www.facebook.com/teenchoiceawards. Follow TEEN CHOICE 2014 on Twitter at @TeenChoiceGirl, and join the conversation using #TeenChoice.